The quilt is a lap quilt made for Mom for Christmas. The photo shows the blocks up on the design wall prior to piecing them together. It's all together sewn together now, safety pin basted and ready for machine quilting. 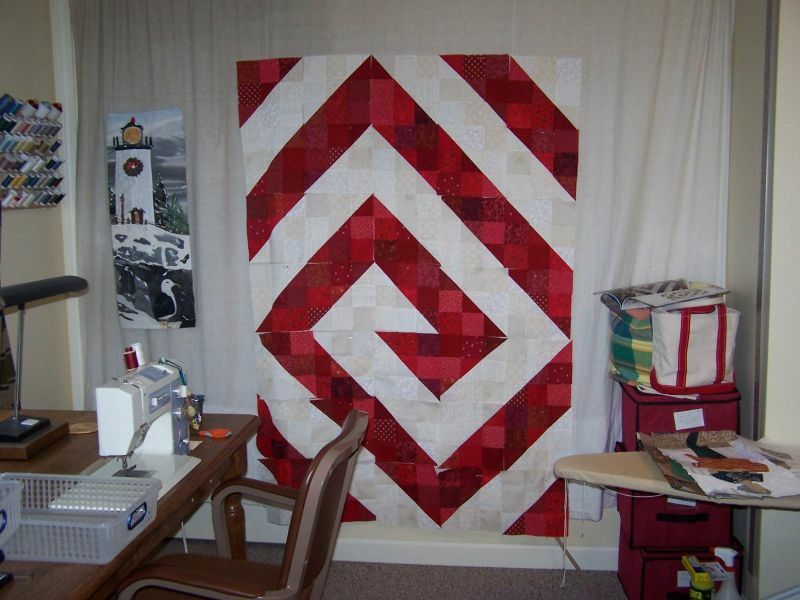 The days of hand quilting are long gone. The panel to the left of the quilt blocks is a challenge done last year. Each of us got a copy of a Christmas card and the leader cut it in four pieces vertically. I lucked out and got to recreate the part of the card that showed the lighthouse and seagull. Lots of fun but more difficult than expected. Button, button, which button? The button band on Marina is done but NOT blocked yet. Sure am hoping that it lies flatter than it does unblocked. Might have to put a cinder block on top of it. Photos are of buttons I'm previewing for the sweater. Sleeves still have to be knit so there is a ways to go before wearing it. Our local button shop closed recently after 25 years so I stocked up. Tell me over on the Marina Yahoo group which one you like. Anne, I liked the second one in group four and the middle one in group 1. The quilt is beautiful, I'm just learning how to quilt and finding it quite enjoyable to do. I am voting for the metal one in group 4 or the blue one in group 2. I like the blue one in group 2. Looks like a good match. I purchased thistle pewter buttons for my Marina so my vote is the thistle button in group 1.